Growing up Chapathi,Rice items like Pulav,Lemon rice etc was a part of our breakfast menu and not Lunch. Though these days I have started making them for Lunch. One such item is Coconut Rice - Nucchi. 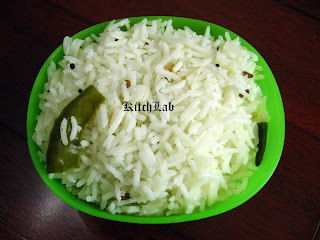 This is simple rice which is easy to make with no much fuss of cutting veggies/Onions and can be made easily either with leftover rice or fresh rice. One pot meal in short. 1)Heat oil in a kadai. When hot add mustard seeds. when they start spluttering add Urad dal and fry until slightly pink. Add methi seeds and fry for a min. Take care not to burn the seasoning. Add curry leaves and fry until done. 2)Add 4 cups water and when it starts boiling add rice ,spilt green chiilis and salt. 3)When the water gets 90% absorbed add the grated coconut.Keep the flame on sim and cook until water is fully absorbed. Serve hot. P.S: I used Basmathi rice so I use 1:2 ratio of rice to water. Even Sona masuri rice can be used for the same. If using Basmathi rice you can soak the rice for 15- 30 mins to speed up the process. Incase of using Left over rice then you can directly add green chilli's in the tadka and then mix in the rice,add grated coconut and salt to taste. On this hot nucchi, add a tsp of freshly made cow's ghee and enjoy. Dershana, thanks a lot dear.. I am truly elated... Will put it up on my blog soon!